The days continue to get longer and warmer and for many of us, Memorial Day Weekend is our first real taste of summer. Grilling outdoors is a great way to enjoy delicious food with your favorite craft beer, especially when the beer is part of the recipe. We teamed up with local Chef Kenneth Hernandez, who created some tasty recipes that do just that. 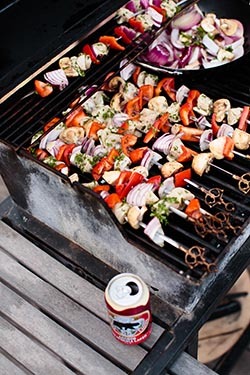 The first of Chef Hernandez’ culinary creations was a potato salad made with Anchor Summer Wheat, which pairs perfectly with this recipe for Anchor California Lager Kebabs, and of course, a cold Anchor California Lager! Chicken Marinade: ¼ cup chopped parsley, mint, cilantro, basil; salt, pepper, lemon juice, red chili flakes to taste; dash of grape seed oil and 24 oz. Anchor California Lager®. Firing up the grill for some tasty kebabs this weekend? Use your Beer Finder to search for Anchor California Lager in your neighborhood.